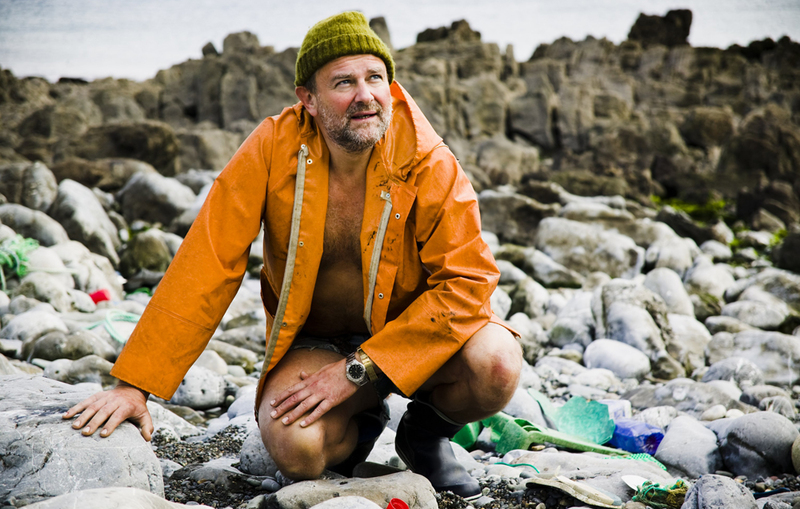 Hugh Bonneville is here to help us do the impossible. In the film James, Miles, Davy and Bill stop for coffee at a cove littered with flotsam and jetsam. Amongst it they are surprised to meet ‘The Beachchomber’. This eccentric man is one of the characters that make the trip something of an odyssey. He tells the boys a strange story about how he spends his days looking for a lost consignment of faulty, brown Darth Vader action figures. They were swept off a container ship nearby some years earlier and he believes this cove will eventually be the place that they are all washed ashore by the rolling tides. It’s a nod towards the part in so many of us that are searching for something that we may never find. It’s 6am. I’ve been running around a while already trying to sort out the day’s fresh load of compromise when I’m told that Hugh has asked to talk to me. Immediately I think something must have gone wrong. I know his hotel is nice and we haven’t forgotten his breakfast – he can’t have been here long enough for us to fail him in any other way surely? I look around the morning mayhem – maybe he has. I knock on the door of the green room where he is changing and preparing. I’m thrilled that he has taken time out to come do this roll. I have been a fan of Hugh for so long. He seems the most ‘natural’ sort of actor on stage and screen with a gift for gravitas and exquisite comic timing – and here he is – staring seriously at the pages of the script. He looks up with an equally stern expression and I am ready for the complaint, in fact I almost apologise involuntarily. Of course the complaint never comes. He breaks into a broad smile, assures me that he is comfortable, happy to be here and looking forward to hanging out with Benedict, JJ, Tom and Adam. Then his stern expression flicks on again and he tells me he wants to talk about the script. “Oh!” I exclaim. Rather taken aback. I have sort of forgotten that’s my job as well. I sit down opposite him as he launches in to a detailed question about the meaning of one of his early speeches. Only now do I notice that he is wearing alarmingly small, denim hotpants. Thankfully the shock subsides when I realise these are half of his ludicrous costume. But I don’t have the time or inclination to over-examine this as Hugh rattles through the ten pages asking if he can move the odd line. Cut a bit here. Add a bit there… He even says that he remembers a line from an EARLIER DRAFT that had a phrase he thinks was important. He’s so right. It IS important. I tell him that he should put it back if he’d like to. A few minutes later, he’s done and I leave him pawing over the words. I walk down the stairs with a spring in my step. It lasted five minutes, but it was the an insight into the incredible talent, skill and knowledge of a REAL PRO. A no-nonsense, business-like, approach to the job of bringing the Beachchomer to life the very best way he knows how. I am so proud to have been the writer (and producer) that will benefit from it and it is again proof that actors are horribly underused in the development of films. I am determined that any film that Western Edge Pictures makes will have this input from as early as possible and that the writer is always in the room to hear it. And we’ll make damn sure that this all happens long before the actor in question is wearing his denim hotpants. A while later. We are on the rocky cove. Hugh looks hilarious but the women on set seem suitably pleased to gaze at him. His performance is breathtakingly good. He makes catchphrases of some the smallest lines – wistfully opening the door to the pain and confusion in the soul of this lost man with just the subtlest of gestures and intonation. It’s a masterclass. But as ever I’m worried about the time. We cannot waste a second today. And Hugh is getting progressively colder and more uncomfortable as a light rain starts to fall and dampen his hotpants. Then something rather wonderful occurs to me. Today nature is on my side and in a way that couldn’t be more apt, she is on the side of our Beachcomber. We CAN’T run over time and it isn’t ME that has to hurry the proceedings at all today – because the tide is coming in. I notice that the sea is now lapping at the feet of Moritz, our young lighting apprentice, who is holding a reflector at the edge of our ‘set’. He is Bavarian and made of too stout a stuff to even acknowledge it, but nevertheless the Atlantic has decided we should move on and it won’t take no for an answer. I sit back and watch Hugh. He must be tired, but doesn’t complain. ‘Time and tide wait for no man’ and at last we are done. Hugh is taken to meet a train. I won’t get to see quite how good his scene is for some weeks yet. His day on set seems like it’s been at least two. At this point I’m told that we don’t have a night security guard and someone has to stay there all night to watch the vehicles, make sure the pig is roasting properly for the next day’s carnival scene, then turn on the kitchen truck at 3 am to power the freezers and heat everything in time for the crew’s breakfast. I sigh. The last of the crew leave. I sit alone with a beer in one hand and my ‘Night Security Torch’ in the other. I sit on the bonnet of the Land Rover looking at the cove. The pig is rotating slowly on the spit – looking at me every 37 seconds as if to say “You think you’ve got problems!”, the seagulls are settling on the cliffs and the tide is starting its endless turn again. This entry was posted on November 4, 2011 by mug7. It was filed under Third Star Production Diaries and was tagged with Actor, Adam Robertson, Barafundle Bay, Beach, Beachcomber, Benedict Cumberbatch, Cast, Casting, Crew, Darth Vadar, Davy, development, Downton Abbey, Filming, Hugh Bonneville, JJ Feild, Movie, Mug 7, Pembrokeshire, Production Diary, script, Shoot, Tea, Third Star, Tide, Tom Burke, Vaughan Sivell, writing.